About Animal Totems In earlier days we understood that we were simply a part of the earth. We knew we were only one small part. Now many think humans are the greatest and most important part. But still, we are only a part of the earth, only a part of nature, only a child of Mother, only a part of Spirit. We used to know respect of Nature and killed only what we ate and used only the skins of what we killed and ate. 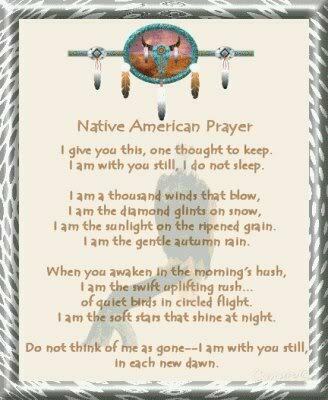 We did not waste life nor disrespect spirits but honored and thanked them for providing us with life, nourishment, and comfort. In earlier days we gave recognition to the power of the animal spirits by wearing skins, masks, mimicking, singing praise, and prayers to specific animals. We painted the animals on our homes, caves, death chambers, and asked the Spirit to guide us to the animal that we consumed and bless the spirit of the animal we kill for we are a predator in the part of Nature and we honored the spirit of our prey. These acts allowed us to remain linked to the animal guides and to accept the power they offer us in lessons, in life, and in death. It reminded us that all animals were our sisters, brothers, and cousins and most importantly our teachers and our friends. It reminded us that we too are animals with spirit. The Natural Power of animal totems has not been lost. They stillhold the power and the knowledge we can use. Only we must remember how to be One with Nature and all that is, has been, and will be. Cultures of the past understood the connections. We must not lose this connection now that we are ‘cultured’. For what was will always be and all those cultures could not have been wrong. There is a reason that Spirit has put all of us together, has given us so many healing stones, and has given us medicine, for the body and the spirit. We are all one. Using Animal Totems will allow you to see and love the earth better, to know life better, to know yourself better, and to commune better with Mother and Spirit. You can be healthier and happier physically, mentally, emotionally, and spiritually in understanding and honoring your animal totems. Animals come to us because they have a lesson we need to learn a power they are willing to share with a friend. They seek to give us a gift of understanding, universal love, energy, and knowledge (ULEK). In general, animals remind us that we are part of the earth; that each creature has a place; that each creature has a skill of its own; that we have instincts given to us from Mother, wisdom born to us that we must awaken. The Animal Totem that comes to you offers you power and wisdom if you will learn to communicate with it, with respect, trust, and understanding. Developing a relationship with a live animal totem takes time, practice, patience and could be very dangerous. Having an animal totem does not mean that you are to pet the animal or even be with it physically. Having an animal totem means that you have lessons to learn and a powerful spiritual friend. Each animal has it’s own special power and message, for each animal has a powerful spirit and an inherent skill. Animal Spirits choose a person to be a companion to, a friend to, not the other way around. You can not think, ‘gee a bear is cute or powerful and I like what it represents so the Bear will be my Animal Totem’. No, the animal will choose you and make itself known to you. You will only need to pay attention to discover what your totems are. After you define the types of animal totems you can go to a questionnaire to learn what animals are your totems. Mistakenly people often think of animals as non-spiritual, uncultured, and less intelligent than humans. Some people do not even think animals have Spirit. Not so – an animal is close to Spirit, is Spirit because they have never been taught differently. They know the truth of ULEK for they are ULEK. Animals are wondrous happy creatures – think of these things to remind you. Could you weave a bird’s nest or spider’s web? When discovering totems you must first understand if the totem is a Life Totem, A Journey Totem, Shadow Totem, or a Message Totem. All totems are powerful but the meaning that the totem brings will vary on your action depending on what type of totem has come to you. Your Life Long Animal Totem works with you throughout your entire life or until such time that you no longer need that animal totem. It is always there when you need it’s powers, always reminding you of your power and connectivity. You may have only one or a few Life totems. They may become your Life totem at any time. But the primary Life Totem will be our focus at this time. The messages that your Life Totem brings are a hard reminder from Mother. Your Life Totem is always there for you and generally reflects your inner spiritual nature. Many call your Life Long animal totem your Spirit totem. For example if your Life Totem was a Penguin you would be a person who should be very spiritual since the penguin moves better in water (the symbol of the astral plane – which is were we go when we dream) than it does on land. Being able to leap out of the water (up to six feet) represents the ability of out of body experiences. It is also important to understand which type of penguin is your animal totem since some have additional characteristics that are important to consider, like most penguins life in tropical conditions not arctic ones. you; to be sure you are not in a place at a certain time so that you avoid an accident or can catch a phone call or meet someone you are supposed to run into. accepted the lesson that animal has for you. Remembering can be painful and sometimes without any real benefit. But much of the time it helps us move ahead like a spur that tells us not to tarry but to go on and do what we have to do. It is far too easy to carry around a u s ga nv tsv, a false guilt, a wrong idea, to override our good memories. We lose sight of the positive things we have done and the happiness we have shared by recalling a thousand impossible wishes we wanted to come true. But it does no good to dwarf the present time because the past was not what we hoped it would be. We cannot help but recall things and times and people dear to us – but to remember them with pleasure does them more honor than to focus on what we did or couldn’t do in the past. We know without being told when we have acted unkindly or behaved unjustly toward another. Intolerance, whether it is personal superiority or religious bigotry, serves only to isolate us from the greatest joy in life the sharing of ideals and happiness and friendship. We must be patient and fair toward anyone whose opinions differ from our own. There is a much better chance of convincing those whom we hope to influence bybeing an example rather than a voice. It is much easier to be led than to be pushed, and not so hard to be tolerantwhen we recognize within ourselves the reasons we are not always tolerant. It sometimes becomes habitual to be dissatisfied with everything we see others do. We don’t take time to understand and know the basis of their actions. We often fall short of listening to them long enough to understand, and their next words or actions may explain it. Your inner beauty is beyond measure. I am a being filled with beauty, light, and love. Remembrance Day-Veterans Day Honor, Reflection, Celebration And Remembering All Soldiers That Served Our Countries. Remembrance Day /Veterans Day is reflection of the past, celebration of life and those that provided the freedom enjoyed , and to look toward a better and brighter future in honor of those that made the greatest of sacrifices their very lives. It’s a time to give thanks for those who have given their lives to ensure all life, liberties and freedoms are maintained. It is a time of honor and great pride to those soldiers that came back and to celebrate the fruit of their sacrifice. 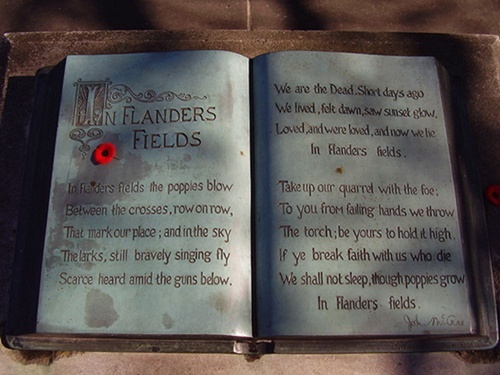 ~ John McCrae (1872-1918)~Flanders Field was written on May 3, 1915 by Canadian physician and Lieutenant Colonel John McCrae, as he bore witness the death of his friend who was 22 year old Alex Helmer on May 2, 1915. Helmer was killed by a shell burst. McCrae wrote this poem out of grief and anguish as he just finished performing the funeral ceremony for his friend. With a calmness and reflective stature as he looked from a distance at his friends grave and surrounded in the environment and ambiance of poppies springing up from the ground, gave McCrae the idea to write this poem in honor of his friend and all fallen soldiers. From the Battle at Queenston Heights in the War of 1812 up through World War I (1914-1918), World War II (1939-1945), and the Korean War (1950-1953), native peoples have fought long and hard. Volunteering en masse for active duty, despite being exempt from Canadian conscription laws, it is estimated that 4,000 men gave of themselves to fight in the Great War of 1914. 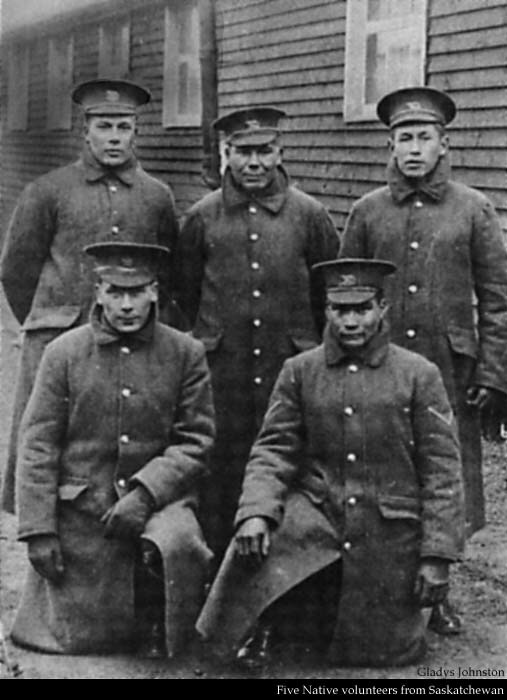 Many natives, living in some of Canada’s most remote areas, enlisted with great personal effort. One man by the name of William Semice walked from Lake St. Joseph to Port Arthur in order to enlist. This was a distance of over 500 miles. John Campbell, another patriotic native, travelled three thousand miles by trail, canoe, and river steamer to enlist in the Canadian Expeditionary Force at Vancouver (The Indian News, 1970, Vol. 13, No. 8, p. 3). Commander of Royersford VFW Post 6341 in PA.
1 TREAT THE EARTH AND ALL THAT DWELL THEREON WITH RESPECT. 2 REMAIN CLOSE TO THE GREAT SPIRIT. 3 SHOW GREAT RESPECT FOR ALL YOUR FELLOW BEINGS. 4 WORK TOGETHER FOR THE BENEFIT OF ALL MANKIND. 5 GIVE ASSISTANCE AND KINDNESS WHEREVER NEEDED. 6 DO WHAT YOU KNOW TO BE RIGHT. 7 LOOK AFTER THE WELL-BEING OF MIND AND BODY. 8 DEDICATE A SHARE OF YOUR EFFORT TO THE GREATER GOOD. 9 BE TRUTHFUL AND HONEST AT ALL TIMES. 10 TAKE FULL RESPONSIBILITY FOR YOUR ACTIONS.